"O Lord, the great and awesome God, keeping covenant and steadfast love with those who love you and keep your commandments, we have sinned and done wrong, acted wickedly and rebelled, turning aside from your commandments and ordinances. We have not listened to your servants the prophets, who spoke in your name to our kings, our princes, and our fathers, and to all the people of the land. "To you, O Lord, belongs righteousness, but to us open shame, as at this day, to the men of Judah, to the inhabitants of Jerusalem, and to all Israel, those who are near and those that are far away, in all the lands to which you have driven them, because of the treachery which they have committed against you. "To us, O Lord, belongs open shame, to our kings, to our princes, and to our fathers, because we have sinned against you. "To the Lord our God belong mercy and forgiveness; because we have rebelled against you, and have not obeyed the voice of the Lord our God by following his laws, which he set before us by his servants the prophets." 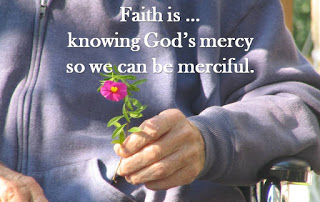 At that time, Jesus said to his disciples: "Be merciful, even as your Father is merciful. Judge not, and you will not be judged; condemn not, and you will not be condemned; forgive, and you will be forgiven; give, and it will be given to you; good measure, pressed down, shaken together, running over, will be put into your lap. For the measure you give will be the measure you get back." THE KIND OF PEOPLE WE ARE BECOMING . . .
Let us be challenged this Lenten season to truly try giving without counting the cost or expecting something in return. To be the first to forgive. Jesus tells us that only the measure we give will be what we receive. and gladly forgive one another.